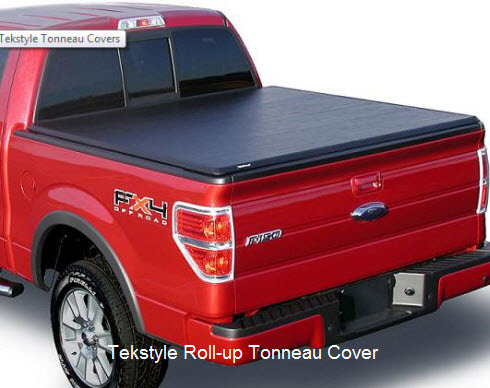 Tekstyle Tonneau Covers come in Snap-on and Roll-up versions. Tekstyle Tonneau Covers are made by Back Country Accessories in Palatine, Illinois. The company also makes sport bars and nerf bars, if you’re in the market. Note (22-Jan-2015) : It appears as if this company has gone out of business. The information is retained here for reference purposes. The two soft tonneau covers they make use all metal frame components, have a simple clamp-on install procedure and use 20 oz. heavy duty double coated vinyl fabric for the tarp. The big diff is one of these soft truck bed covers snaps-on and the other rolls-up. There are a couple of other features you might be interested in below. Oh, and by the way, I've heard that if you call these guys on the phone and talk nice they have other tarp colors than black. Cover Weight : Approx 50+ lbs.